You have been asked to make a declaration or statement of fact under oath. You have asked someone to make a declaration or statement of fact under oath. Our Affidavit forms allow you to submit any type of statement and can be customized to any state. 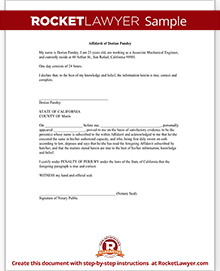 To use this form, simply fill in a few items of information and take it to a notary public to be signed and notarized. A General Affidavit is a sworn statement of fact on any topic. Our Affidavit is such an Affidavit. It includes a space for entering a unique statement. It is for general purposes rather than designed specifically for a certain situation, such as a statement of name change. This Affidavit can be made suitable for most situations. We offer Affidavits for specific scenarios if that would suit your needs better. The first qualification is that the signee is competent, which in most cases means of sound mind and of age (often 18). They should also be someone who has first-hand knowledge of the information they are attesting to and they should not feel pressured or coerced into signing the document. They should understand that if they are proven to have made false statements that they are violating the law and committing perjury. They should also possess the legal ID required for the notary services such as a state-issued driver's license or ID, U.S. Military ID, Resident alien ID or U.S. passport. Do I need a lawyer to make an Affidavit Letter? In most cases, no. Affidavits are simple to make. Our document builder can generate the letter for you easily after you submit a bit of information. It just needs to be signed and notarized to be valid. If stakes are high, you may benefit from having a lawyer review the statement that is to be signed. They may be able to suggest edits to the statement before it is signed that may help your case. What is the notarization process for signing an Affidavit? Affidavits can be used for many reasons, but they all share a common trait: the person signing is making a declaration, under oath, that what's in the affidavit is true to the best of their knowledge and belief. Here are some common types of affidavits and what they're used for. Affidavit of Birth In the event you can't locate your birth certificate, this Affidavit can be used to verify some of the facts surrounding your birth. Typically, this Affidavit form will be completed by one of your blood relatives or the attending midwife or physician. This person will state their relationship to you, how they have knowledge of your birth circumstances, and attest to the relevant information (such as county and date of birth). Affidavit of Name Change If you go by a name different than your birth name but haven't officially changed it through the court, use an Affidavit of Name Change. 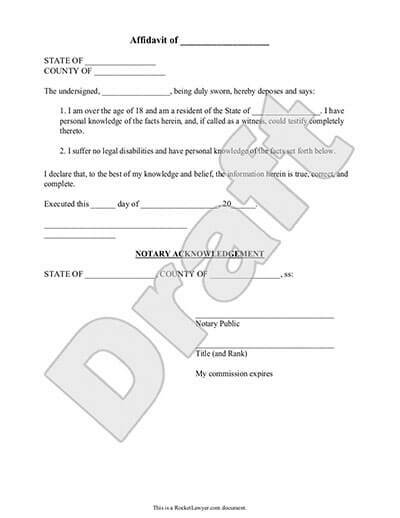 Typically, another person (most often your spouse or a blood relative) will sign this and swear that you use a name different from your what's on your birth certificate. Affidavit of Support Most commonly used while sponsoring an immigrant to the United States, this Affidavit form simply states that the signer will be financially responsible for the incoming immigrant. The names and addresses of both parties are commonly included with the sponsor's signature. Affidavit of Heirship In the event that someone dies without a Will, an Affidavit of Heirship can be used to help ensure that the deceased's heirs can gain control of their estate. Generally, this Affidavit will need to be witnessed by people who don't stand to benefit from the deceased's estate and it can be instrumental in avoiding the often costly and lengthy probate process. Affidavit of Death This is a simple Affidavit usually handled by an estate administrator. It's used to notify creditors, the court and businesses that someone has died. This allows the executor or estate administrator to perform their duties. Affidavit of Domicile This Affidavit is most commonly used by estate administrators and executors when transferring cash, stocks or investment assets of the deceased. Banks and accountants often need proof of the deceased's residence to release this property, while government agencies may use this Affidavit to levy certain taxes. Affidavit of Residence This legal document simply states your place of residence and is often used shortly after you've moved but before you've submitted paperwork to the DMV or other government agency. You may need it to enroll your child in the local school or to swear to a court or business that you reside at a certain address. Affidavit of Small Estate Small estates generally have an easier path through the probate process. You can use this Affidavit to inform the court that the estate in question qualifies as a "small estate," which is usually capped around $150,000. Note that residents of New Hampshire, Kentucky, and Georgia should not use this document. ID Theft Affidavit In the unfortunate instance your identity is stolen, use an ID theft Affidavit to inform creditors, banks and other businesses. You'll note the day you became aware of the theft and swear that certain actions, like large purchases, were made by the thief, not you. These are just a few of the most commonly used Affidavits. For a more complete list, see our list of family and personal affidavits. Our step-by-step interview process makes creating a printable Affidavit Form easy.